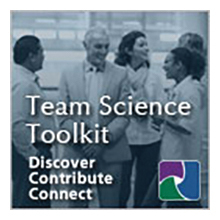 The emerging science of team science (SciTS) field encompasses both conceptual and methodological strategies aimed at understanding and enhancing the processes and outcomes of collaborative team science. The SciTS field focuses on understanding and enhancing the antecedent conditions, collaborative processes, and outcomes associated with team science initiatives, including their scientific discoveries, educational outcomes, and translations of research findings into new practices, patents, products, technical advances, and policies. The Annual International Science of Team Science (SciTS) Conference is a forum to enhance our understanding of how best to engage in team science to meet society’s needs, an important conduit for translating empirical findings about team science into evidence-based effective practices for scientific teams and funders of team science—a bridge between the praxis and science of team science. The Conference aims to serve as a point of convergence for team science practitioners and investigators studying science teams, to engage funding agencies to provide guidance on developing and managing team science initiatives, and to afford data providers and analytics developers insight into team tracking and analysis needs.